Unified communications (UC) is a term used to describe communication with different forms and methods of technology. The term arose in the mid-1990s, when messaging and real-time communications began to combine, which was mainly due to the evolution of networking technology and Internet Protocol (IP). Call control and speech recognition with non-real-time communication services such as unified messaging. Unified communications is an evolving set of technologies that automates and unifies human and device communications in a common context and experience. It optimises business processes and enhances human communications. Eliminates device and media dependencies by integrating systems and business processes. This ‘business process’ approach to integrating UC functionality can result in bottom line benefits that are synergistic, that is, greater than those achievable by personal productivity methods alone. Unified communications & collaboration (UC&C) is a term used to describe the integration of various communications methods with collaboration tools such as virtual white boards, real-time audio and video conferencing, and enhanced call control capabilities. 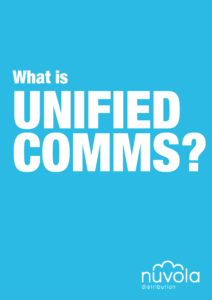 Unified communications & collaboration as a service (UCCaaS) is sometimes used to describe cloud-based UC&C platforms. Compared to premises-based UC&C solutions, UCCaaS platforms offer enhanced flexibility and scalability due to the SaaS subscription model. Nuvem the Cloud UC is a service provided by Nuvola. To some degree most businesses are leveraging some or all these technologies today, but typically in a non-unified, independent manner. Not only is this inefficient from a maintenance and operations standpoint, but the benefits of integrating communications and working as one system is being missed. Thankfully though, a UC system can be put together modularly; allowing time to be taken to integrate each component and make sure it’s running smoothly before moving on to the next one. Single Number Reach – Allows users to consolidate all their incoming business calls into a single phone number and receive them wherever they are working. For example, a customer can call a single phone number and it will ring the office phone, mobile phone, and home phone simultaneously. Automated Dialling Out – Automatically notify clients, partners, or vendors about appointment reminders, billing issues, or emergency situations such as an office closure. Connect Remote Offices and Users – Remote office or road/home workers can easily connect to the main office through seamless and secure connections regardless of location. Remote users don’t just take their office extension with them, they also enjoy access to the same familiar phone services that they have in the office. Remote offices are fully integrated and provide a consistent appearance while enjoying the benefits of free internal calling. Companywide Instant Messaging with Presence – Communicate virtually anytime, from anywhere, with an easy to use application that leverages toolbars within common applications, such as Microsoft Office and Internet Explorer. UC instant messaging allows employees to send messages to computers or mobile devices through a secure internal messaging client. Adding Presence to the mix enables you to view if other employees are available, busy, or away from their computer or device. Real-time Information Delivery- With a UC system in place, you can stream RSS feeds, stock quotes, news, local weather, and much more to your desktop XML phone. Client Billing – Easily and accurately capture and bill for the time spent conversing with clients over the phone. Call Recording – Record any call from the beginning whether you are in the middle of a conversation or just hung up. You can even review the call and bookmark critical sections for future reference. Time & Attendance – Employees can easily clock in and out right from their IP desk phones. This also allows supervisors to easily see who is in or out of the office, and even review overtime requests. Additionally, this can be integrated with Accountancy packages or Excel to reduce the time spent on auditing or processing payroll. If you choose to implement a UC system one component at a time or all at once, finding a knowledgeable and proven partner who will design and implement the right solution for your needs is critical. Nuvola Distribution is a Value Added UC Services Distributor providing solutions to our reseller partners. https://nuvoladistribution.com/wp-content/uploads/2016/07/clouds-blue-sky.jpg 550 2000 Michael Man https://nuvoladistribution.com/wp-content/uploads/2016/07/logo-1.png Michael Man2016-11-15 10:46:172016-11-22 10:04:58What is Unified Communications?